What is the greatest benefit of outlining? What is the biggest potential pitfall of outlining? Do you recommend “pantsing” for certain situations and outlining for others? Many times, writers will line up into two camps: outliners and seat of the pansters (non-outliners). But it isn’t that simple. Pantsters, even the famous panster Stephen King, sometimes write a novel that requires some type of outline. And most of us, even it we don’t outline, do some sort of novel pre-planning. 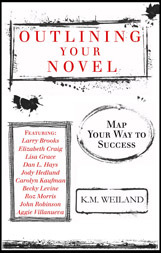 KM Weiland, an avid outliner, describes the outlining processes and the many ways to outline and pre-plan a novel. She also includes interviews with authors that do various forms of pre-planning and their methods. I highly recommend this book. Even if you are a panster, you’ll find some helpful tips throughout. This entry was posted in Book and Movie Reviews, Book Non-fiction Reviews, Resources for Writers by Tamera Kraft. Bookmark the permalink.